Christmas is here already. 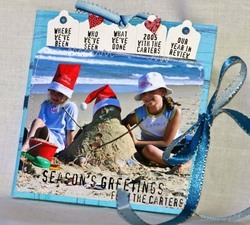 Scrapbooking Memories Special Christmas Issue is out with lots and lots of Christmas layouts, projects and ideas. Rach Richter's gorgeous layout graces this edition's cover. Congratuations Rach! Classic photo capturing those three gorgeous boys of yours. In the next few posts I've added the Chrissie cards from the Scrappin' Step by Step, with some extra details. 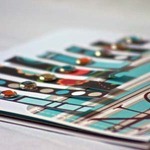 Time is flying by at the moment, it only feels like I put up the details for the last edition... yesterday! As I mentioned above, the Scrapbooking Memories Special Christmas Issue to out! Over the next few posts I'm sharing the Christmas cards I made to be included in the gallery of my Scrappin' Step by Step. 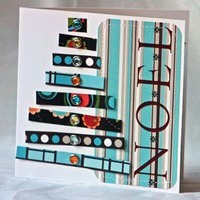 Below is the first of my four cards which featured in the gallery. 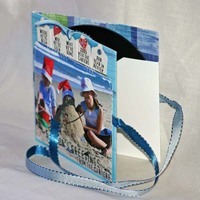 It is a CD journal case from Pine Cone Prints. Covered with Junkitz papers. The front tags read "Where we've been. Who we've seen. What we've done. 2005 with the Carters. Our year in review." 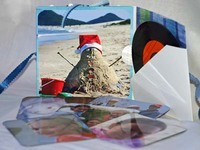 It is designed as a Christmas card which includes a digital photo album and newsletter (on the CD) to family and friends. So the recipients have a few photos straight away when they open the card, there are some photo magnets tucked into the pocket on the inside cover. I love the colours of these papers. They are from Die Cuts with a View. Small strips of paper were used to make a Christmas tree design, attached with s.e.i. rhinestone brads. The NOEL word is a Transfer Titles rub on by My Mind's Eye. 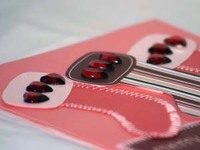 Inside the card is a pocket for a gift voucher or money. 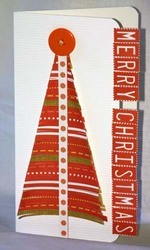 This "Merry Christmas" card uses Fontwerks paper to make the fringed Christmas tree. The Merry Christmas is made from individual letters cut from a sheet of Fontwerks paper. 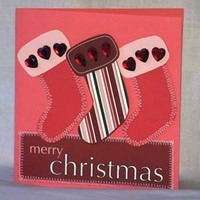 This little card uses a My Mind's Eye stocking die-cut (the middle stocking). I used the die-cut as a template for the other two stockings, cut from co-ordinating cardstock. The middle stocking is raised slightly with Magic Mount. The "merry christmas" is also from My Mind's Eye. One of my other interests is cooking. I've thought for a while about putting bits of cooking information of here, and after cooking beetroot this afternoon to have with our dinner, I thought I'd start my journey of food and drink here with... beetroot. I loved beetroot as a child, sliced, straight from the tin, it was added to many meals. One recollection of cooked "real" beetroot as a child was pickled beetroot in vinegar - yuk! Lately I've rediscovered it. It has been a neglected vegie in my opinion until the last few years. It is now appearing more and more in the fruit and vegie markets. Buy it in bunches as baby beets (about the size of a golf balls) or regular beetroots (maybe up to the size of a tennis ball). To cook - it's simple. Cut the beetroot from the stalk, leaving a few centimetres of stalk attached to the beet (no need to peel - if you peel the beetroot it will "bleed", you won't loose any flavour, but it will make a big mess). Pour some water into a saucepan and place a steamer into the saucepan. Pop the beets into the steaming basket, place the lid onto the saucepan and cook. Steam for about 30 minutes (for the baby beets) and between 1 - 1.5 hours for the large ones. Allow to cool. Once cooled, you can now peel the beetroot but rubbing your fingers over the surface. The skin should just slip away from the beetroot. Some people bake their beetroots instead of steaming, I think you end up with similar results, the baked version may have a slightly sweeter taste. While warm, I cut the beetroot into cubes, drizzle (not drown) with olive oil and balsamic vinegar. Serve as a vegetable with dinner. One of my favourite beetroot salads... Use beetroot as above, allow to cool completely, crumble feta cheese over the beetroot and mix through LIGHTLY. Garnish with walnuts. Add some extra olive oil and balsamic vinegar if desired. So what's for dinner at your house tonight??? Oh, by the way, don't throw out the leaves and stalks that come attached to the beetroots. I juice mine with carrots, celery and oranges. You still get the earthy beetroot flavour in the juice! 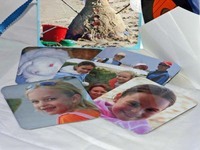 I've added my layouts from the latest Scrapbooking Memories to my Scrapbooking Layouts Photo Album. Thought I'd also share a few of the details on the layouts in the next few posts here. "BAKING DAY" LAYOUT - from left to right - these little Pebbles Inc sliders were available 'pre-printed' (some of which I used on this layout as well), but these little plastic sliders were blank ready and ready to decorate. Here I added names to the sliders using KI Memories tattoos (rub-on letters); Making Memories leather flowers (the last of my supply) attached to the layout with large coated brads; in the title I used s.e.i. Cardstock Letter stickers which have been lightly sanded on the edges. "HAWKS NEST" LAYOUT - using sliders from Karen Foster. These are plastic adhesive sliders with their own matching plastic 'ribbon'. The words on the sliders were incorporated into the journalling. Last set of details here. "WORK AND PLAY" LAYOUT - left to right - title using KI Memories letters raised with magic mount; Making Memories buckle with assorted ribbon; Making Memories letter slides slipped onto ribbon.